So, as a certified chocolate lover, it probably comes as no surprise to you that Easter is one of my favourite times of the year. I also love that the schools have two weeks off as it means there is plenty of time for us to enjoy celebrating with the children. I wanted to put together a post featuring some of the brands that provide Easter treats. Not all are edible, so if you have a younger child or want to avoid giving your kids chocolate or sweets, there are a couple of alternatives as well. Enjoy! Ok, I couldn’t put together an Easter post without the chocolate heroes that are Cadbury. I have been a fan of their chocolate since as far back as I remember and I was in my element tasting these delicious treats from them. Their eggs come in a variety of sizes, including the totally decadent Ultimate range, complete with a sharing size bar of chocolate. We love the Egg ‘n’ Spoon boxes – they are so much fun to eat with their miniature spoons and replica egg box packaging! Mini Eggs and Creme Eggs are both Easter staples and super tasty too. The Fuzzikins bunnies are super cute and I love that you can rinse them and recolour again and again, providing hours of fun for children over the Easter holidays! The kit comes with pens and felt to help you personalise your bunnies and there are other kits available in the range if you want to extend the fun further! The kids love Haribo and these fun easter selection boxes went down really well with them. The Chick ‘n’ Mix in particular was a big hit, featuring miniature bags of jelly bunnies, tangy chicks, spring time friends and the much loved eggs from Starmix. Perfect as a treat over Easter or to use as part of an egg hunt. Googly Eyes is a drawing game with a difference, suitable for those aged seven and up. Put on the included vision-altering glasses and race to the finish line. There are 162 challenges, divided into three themes – objects, places and entertainment and the game is sure to provide amusement during those April showers. Another game, this one has become a firm favourite in our family. The object is to be the first player to stack all of their cups. It’s trickier than it sounds as you have to match the top and base colours and it can get confusing under pressure! Once I got the hang of this I wanted to keep playing until I won! The game is suitable for children aged 8 and up, and it is such a fast paced game it is excellent if you are looking for something to keep the kids distracted for a short period of time, for example whilst dinner is cooking! Swizzels have released some brilliant selections in time for Easter including their Spring Selection and Easter Mix, as well as a limited edition version of their popular Squashies. I can confirm they are all totally tasty and the perfect addition to an Easter celebration! Biscuiteers make the most adorable iced biscuits. They are available is a whole range of designs but this Beatrix Potter Biscuit Tin is perfect for Easter. They are almost too cute to eat but I managed it and can confirm they taste as good as they look! Looking to do some baking with the kids over the holidays or make up some tasty treats for the Easter weekend? Dr Oetker have got you covered with their fantastic range of baking goodies. A personal favourite would have to be their Mermaid and Llama decorating kits, which are so easy to use to decorate cupcakes and were a huge hit with the kids! Not feeling a chocolate egg this Easter? Blacksticks Blue have created an awesome blue cheese egg, which comes with a packet of oatcakes and a sachet of chutney – the perfect treat for cheese lovers! You don’t have to wait until Easter to enjoy their cheese though, they also have a 150g pack of the cheese, available from supermarkets. LOL fever recently hit our household and the kids absolutely loved opening up these Fuzzy Pets and playing with them together. There are a range of pets to collect and the children really enjoyed washing theirs to discover what they would look like underneath all the fuzzy fur – I don’t think I have ever seen them more excited! The perfect gift for Easter if you are avoiding chocolate or looking for something extra. The Honeycomb from Mighty Fine is absolutely delicious. I was sent both the salted caramel and dark chocolate versions in both sharing bags and bars and loved every bite (I did share, don’t worry). 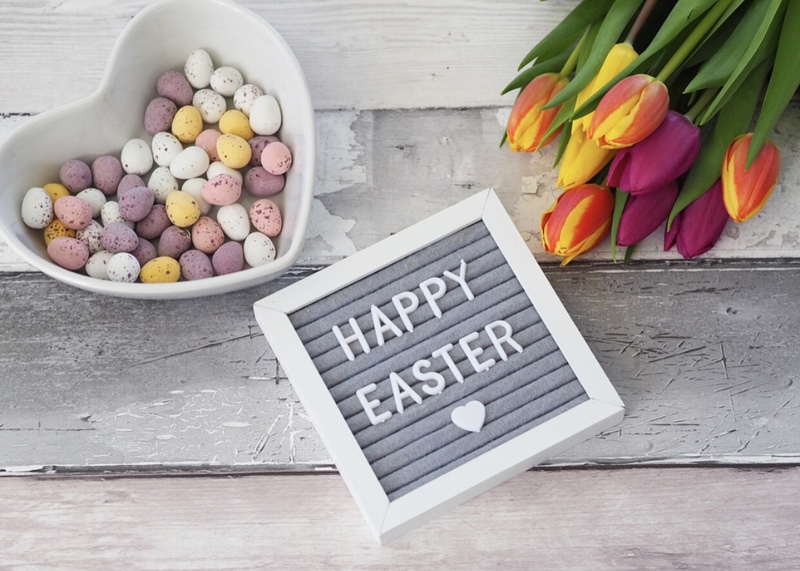 They would make a brilliant addition to your Easter treats and are fairly low in calories compared to other chocolate, whilst also being gluten free. Sold exclusively at Tesco’s, the Lir Chocolates hand decorated Belgian Milk Chocolate Egg is as beautiful as it is tasty. With four uniquely flavoured chocolates from Lir’s Discovery Collection, this is the perfect Easter treat for grown ups. Last, but certainly not least, Penwizard provide personalised books for children of all ages. As Benjamin, at two years, is a bit young for most of the other items in this post, I decided to get him a personalised Blaze book and he loves it!He keeps pointing at the character in the book and saying “It’s me”, which is really cute. As well as personalising the book with your child’s name, location and birthday, you can also change the illustration of the character to match their appearance and add a personal message at the front. I loved how easy the personalisation process was, and the book is fantastic quality. I would recommend the hardback version for little heavy hands! Items featured in this post were gifted to me for inclusion. All words and images are my own.